I was sitting in a doctor’s office one day, and there was a father sitting and waiting with his 2 year old daughter. She was walking around the waiting room, but then wandered too far. So Dad called “Suzy, come here.” Suzy ignored him. The father repeated “Suzy, come here.” Suzy ignored him again. He repeated a third time louder “Suzy, come here!” Suzy turned and looked at him went “Pfffffffffffft” (gave him a raspberry). The father yelled “Suzy, come here now!” Suzy said “No!” The father walked over and picked Suzy up and took her to his seat. Then he proceeded to tickle her and play with her!! Passionate Legacy Principle #5: Expect First Time Obedience. Always ensure that your word is obeyed. Expect first time obedience without argument, not “partial obedience”. Obedience with a bad attitude or after having been reminded several times is not obedience. Don’t limit your children with your own low expectations; they will live up to the standard you set, whether low or high. Make your word valuable by enforcing the rules, if you don’t, your word means nothing and your rules are meaningless. Your follow-through will make your words either garbage or gold. Never give a command you don’t intend to enforce. This aspect is more difficult for parents than for children, but if we can train ourselves to be consistent with our follow-through, our children can learn to obey the first time. Part of training children in first time obedience is holding them accountable for obedience. Always inspect what you expect. When you say “go clean your room,” after they are done go see if they really did it. If they say they are going to a friend’s house, check and see if that is really where they went. If they know you will hold them accountable they will make a habit of following through, but if they know you will never know whether they obeyed or not, they won’t make an effort at obedience and will not gain the practice in right living that they desperately need. Remember there is a difference between a request and a command: A request is just a suggestion of helpfulness or a favor, with a choice to fulfill the request or not. A command is an order, and is meant to be fulfilled. Make sure you are always clear with your children whether you are making a request or a command and make sure they obey if it is a command. Use commands sparingly. Authority should not be misused to treat children like personal servants. The authority we have as parents should be used for the benefit of the children we oversee, not our own personal interest. Have you ever heard a parent order a child around? “Go get me a pop from the fridge.” As children get older they recognize the misuse of power and they begin to resist authority if they believe it to be selfish (Mark 10:42-45). In this section we will refer to a couple techniques for interacting with a child (broken record, physical assist), these will be more clearly defined in future lessons. These items are adapted from Taking Charge, by Joanne Nordling (SIBYL Publications, 1999). 1. Use a positive tone of voice. A positive tone of voice lets children know you respect them. Even describing information (“it’s time for bed”), if delivered in a harsh tone of voice, can invite a power struggle. 3. Don’t give a choice if there is no choice. By saying to the child, “You can choose to do either this or that,” you empower the child and give him or her a sense of control. However, the choices you offer must be legitimate choices that you can live with. Examples: “You can either go to bed right now or hear a story and then go to bed.” “Would you like to play for 10 more minutes before we go or go right now?” “You can play without pushing or you can sit out for part of the game.” Never give a choice where there is no choice, and do not ask children if they want to do it. For example “Do you want to go to bed now?” or “Let’s go to bed, okay?” By asking children if they want to or if it’s okay, you have given them the choice of not going to bed. It is not fair to expect a child to mind when you have not given a clear command. An important point: If children refuse to act on either choice, you must make the choice for them. If the child refuses to move, you can step in to use the physical assist or the broken record corrections. 4. Be reasonable in the type and number of choices or commands you give. You will have to be the judge of how many commands per day are reasonable, but remember, the fewer commands you give the more likely the child will take notice when you do give a command. As the child grows toward puberty, you should need to give fewer and fewer commands. The older the child, the more areas of life should be in his or her own area of control. We do not own children. Any command that orders children around just because the adult wants to wield power over them is not reasonable. Any command that tries to force a bodily function on the child is also unreasonable, “Eat that food” or “Stop wetting your bed” are unreasonable commands because they attempt to control another human being’s interior bodily functioning. All body functions belong solely to the person who lives in the body, of whatever age. 5. The fewer words the better. Be as brief as possible. Give only one, or at most two commands at a time. Giving too many commands at once is confusing. “Gary, go upstairs and bring me a diaper for the baby, and on your way, turn off those bathroom lights, and when you’re done with that, you can either take the letters on the hallway table out to the mailbox before we watch Sesame Street or before lunch.” This kind of command is too hard to remember even for a very intelligent child. Keep it short, clear and simple. A one word command is sometimes the best. Rather that telling a five year old who knows better to pick up her coat and put in on the rack, simply point at the coat and say “Coat,” in an authoritative but not angry voice. A single word is hard to argue with. 6. Be sure you can follow through with the correction, otherwise do not give the command or choice. If you are in a public place, like the grocery store or at a school play, and you know you will be too embarrassed to carry out the correction, do not give the command. You must be consistent in carrying out the correction the first time the child does not mind. It is better to not give the command than to sabotage yourself by commanding and then not seeing it through. In the case of Suzy, (see above) if the father was too embarrassed to discipline his child at the doctor’s office, then he could have started by just physically picking her up rather than trying to convince her to obey or he could have given the command but then taken her outside to give a time out or spanking if she did not obey. Allowing Suzy to say “no” without consequence and especially rewarding her with a tickle, is teaching her that she can treat Dad however she pleases and that his words are meaningless. 7. Do not respond to self–indulgent behavior. Concentrate on dealing with the not-minding behavior. Do not let the child’s accusation, complaints, whining, name calling, or scolding deflect you from carrying out the correction for not-minding. You will sabotage yourself if you get hooked into responding in any way to the self-indulgent behavior (more on this in a future article). When these tips become habits, they promote first time obedience in children. They are a starting point and form the general foundation for expectations of behavior. In the next lesson, we will get more specific about how to administer discipline when first time obedience does not happen. We will be learning the four categories of disobedience and how to specifically address each one with the appropriate discipline. Do you realize that you may be sabotaging your own discipline of your children? Many parents do not even realize that the way in which they handle the rules of the house, has a direct impact on the effectiveness of their parenting. Passionate Legacy Principle #4: Make the rules of the house clear and consistent. Have only a few rules, and make sure they are clear to everyone and enforced without fail. They should be written, posted, and reviewed often. Choose your “hills to die on” and stick with them. Don’t make rules just for your convenience, every rule should have a strong basis for its existence, whether safety, morality, or respect for others. Ephesians 6:4 says not to exasperate your children. Colossians 3:21 says to not embitter your children, or they will become discouraged. There are several ways we exasperate our children and sabotage our own discipline. One way that we can exasperate our children is by not having clear rules and guidelines. Parents need to make sure that their children know what specific guidelines they are expected to live by. They should be written, posted, and reviewed often. Children are exasperated if a rule was never communicated but they are punished for breaking it. Children also need to be aware of what consequences will follow if they do not follow these rules. If you communicate ahead of time, then they are not surprised by the consequence and will be more likely to understand that justice is being done. They ‘earned’ the consequence by choosing not to follow the rule. Being obedient is an impossible task if they are unsure of what the rules are. Children will not determine in their heart to follow the guidelines unless clear guidelines have been communicated. Billy is standing on the coffee table while his mom talks on the phone 10 feet away. Fifteen minutes later, mom hangs up the phone and says, “Billy, get off that coffee table!” Billy has now learned that standing on the coffee table is okay as long as mom is busy talking. It can be exasperating to children when parents allow them to break the rules sometimes, but not other times. We must enforce all rules consistently. This is important because if sometimes they are punished for breaking a rule and other times it is overlooked, they will not take the rule, or the rule-giver, seriously. It will seem to them as not actually wrong if their parents only see it as wrong part of the time. They will be exasperated that the parents knew about it and overlooked it the other times but now they are being punished. This will be seen as fair - and it is! If they feel they are being mistreated they will become embittered. Joking is another means of inconsistency. Authority is not a game. Never joke in your use of authority. It sends a confusing message. It makes it hard to trust and respect your words. Make your word valuable by meaning what you say and saying what you mean, if you don’t, your word means nothing and your rules are powerless. Your consistency will make your words either garbage or gold. Children will eventually learn to overlook your instructions if you earn a reputation of not really meaning what you say, joking about being angry, or joking about abusing your authority. It makes your authority into a mockery and you will lose the trust of your children. Too many rules can also be exasperating. If your child is failing in 17 different areas he will have no motivation to change because it is too overwhelming. Focus on only a few problem areas and carefully consider if you should really make rules about small things such as: turning off the lights, clothes in laundry, etc. Focus on the biggest issues in your child’s life such as lying, stealing, not doing homework, etc. Wait until he is doing well in the big areas before you focus on the small issues. Arbitrary rules can embitter children. Demanding that they serve you just because they are smaller will embitter them toward your authority. I have seen parents who are watching TV, tell a child, “Go get me a pop from the fridge, now!” This was not asking politely for a favor, but a harsh demand. This parent is teaching his kids that authority figures use (abuse) their power for personal, selfish interests. Making rules only for your convenience rather than morality or safety will also embitter them. If you cannot think of a good, meaningful reason for a rule or a request, perhaps you should reconsider it. Jesus made our rules pretty simple, “Love God with everything you are, and love others as yourself.” We should take a page from His playbook with it comes to keeping things simple for our kids. Today, we continue on the principle of accepting your mission from God to be the authority in your home. Does self-control come naturally or is it a learned skill? What is the relationship between a child’s ability to control himself, and his ability to acquire moral training from his parents? If a child is raised without being taught self-control, how will that affect his or her ability to follow God later on? We had a foster child, who we will call Molly, a first grader, that was not doing well in school when she first came to live at our house. Her teacher reported to me (almost daily!) that Molly was disruptive, rude, would cut her clothes with scissors during class, would get up and help herself to a drink of water at inappropriate times (like during the flag salute), would talk back and even yell at her teacher. When I asked what consequences where applied when she misbehaved, the teacher said she was trying to ignore the behaviors because Molly was going through a tough time. I suggested that we come up with a consequence. The next Morning, when Molly disobeyed her teacher, she sent Molly to a fourth grade class room where she had to have her head down on her desk for 20 minutes. When Molly came back she asked the teacher, “Why did I have to go to that classroom?” The teacher answered, “From now on, whenever you disobey in class, that is where you will go.” And Molly replied “Teacher, from now on I am going to obey you.” And she did. In fact, her behavior changed so completely, that it resulted in a dramatic improvement in her academic performance. She went from almost all “Needs Improvement” to “Satisfactory” in behavior, and from almost all 1’s to 3’s in her academic grades. That is a huge improvement, all as a result of having consistent expectations and consequences. Of course, not every child is going to turn around as quickly as Molly, but this story illustrates a principle very well. The child who has been restrained from always getting his own way by arguing, throwing temper tantrums, or disobeying, is also set free. He is free to do what is right rather than being a slave to his sin nature, and as a result he is free to enjoy peaceful relationships with his friends and family. Every child desperately needs boundaries. They are insecure and unhappy without firm guidelines and direction that provide order to their lives and protection from danger. Like an adult who wants to know exactly what is expected of him on a new job, a child faces new situations daily and needs his parents’ help in setting the boundaries for his appropriate behavior. God’s Word declares parental controls to be essential (Prov. 29:15; 1 Samuel 3:13). It is not love to raise a child who lacks self-discipline and is therefore guided by his or her self–centered feelings and desires. Many of us have struggled with some of these desires in our own lives. Do you wish you would have been better trained in self discipline? Controlling a child’s behavior is an expression of parental love and shows true concern for the best interest of the child. True love will require a personal sacrifice on the part of the parents. They must be willing to take the time to monitor closely the child’s behavior. They also must be willing to face the inevitable conflict that occurs when the child must be confronted with his disobedience. The sacrifice involved in controlling a child also includes the immediate correction of each new misbehavior, even when it is an inconvenience to the parent. Loving parents must be more concerned with doing what will best benefit the child rather than what is most convenient for themselves. Parents have to overcome some natural hindrances to asserting their authority and requiring obedience from their children. Some of the things that keep parents from controlling their children's behavior are: feelings of inadequacy, not wanting to be a hypocrite, or fear of losing the child's love. Parents can overcome these hindrances by realizing that even though imperfect, they have been delegated the responsibility of training their children by God, and by accepting God and His way as the authority in their own lives. Children are not born with self control. They need to have external controls put in place by their parents until their internal self control can be developed. Parents need to control what and when they eat, when to sleep, what clothing to wear, how to act, and what is allowed to influence them. Therefore, the job of every parent is to function as the child’s self control, until the child is able to govern himself based on his own personal set of biblical principles of right behavior. Parents train children in biblical morality even before salvation, because in doing so, children gain an awareness of God’s standard of right and wrong. They are not born with this awareness. First we teach God’s moral standards, just like God gave us the law before he gave us Jesus. God gave us the Law so that we would see our sin and therefore our need for a Savior. In early parenting, external pressure is necessary to bring about moral behavior even though a young child has no cognitive understanding of the reason for the behavior. With adults, beliefs precede actions; with children the opposite is true: actions precede beliefs. Parents should insist on correct behavior long before the child is capable of understanding the moral reasons for the behavior. Children first learn to act morally and then they learn how to think morally. So first we need to train children to behave morally then we move on to teaching the moral principles behind the behavior. Actions come first, understanding comes second. Early moral training is also essential because, as you train a child to adhere to moral behavior, you are simultaneously training him in self control. Self control is the most basic virtue. It is necessary for the application of kindness, gentleness, proper speech, controlling negative emotions, concentration, focusing, sitting skills, and many other behaviors. Don’t wait until your child is older to start training in these skills. These are moral developmental skills, not stage–acquired abilities. They are also skills that depend on structure from the earliest days of life. Structure, training and discipline are essential in the early years to maximize a child’s moral and intellectual development. A child who has been trained in moral behavior when he is young will begin to operate with self control as he internalizes the biblical principles for himself when he grows older. But a child who was not brought under the control of his parents, will lack self control, will lack a conviction of right and wrong, and will rebel more and more violently at any attempt by parents, school, or any other force that threatens to restrict his complete freedom. Without self control as a base for moral behavior, there will be nothing to curb his insatiable desire to serve his selfish appetites. The child who has established his own control over his parents, will continue to exercise his authority over them to satisfy each new, self centered feeling or desire that drives him. We have just added a new Bible Study designed for a parent to lead children. The topic is obedience to God and respect for others and those in positions of authority. This is a very important concept for children to learn very young. This study can be done with kids as young as 3 and as old as teens! Ask the questions, look up the verses, and make it an open, friendly discussion format. The TV and movie action-drama Mission Impossible made these words famous. When it comes to parenting with authority, this famous phrase is particularly appropriate. The question is, “Are you willing to accept your God given mission to parent with proper authority?” Sadly, many parents do not take seriously this concept. Sometimes parents find it difficult to rebuke children with authority because they don’t feel adequate for the job, they don’t know what to say or do, or they don’t think the child will actually listen when given instruction. These obstacles can and should be overcome, because parental authority is God given. Our children have had several “first year” teachers in the public school system. Because of their lack of experience, they tried to gain good behavior by being a “friend” to the students. So these new teachers very quickly had classes that were out of control, and as a result, learning did not take place. Our children were frustrated because so much class time was taken over by behavior problems. These teachers believed that children will obey you if they like you. This is simply not true. Children will obey you if you teach them your expectations and show them that you will back up those expectations with consequences. If the teacher had shown within the first week, that she had high expectations of the students, and required their cooperation, instead of trying to be their friend, she would have gained the control she needed to teach the class. Our children had previously attended a private school, in which classes are very disciplined and students are expected to show respect for their teachers. As a result, very little time is wasted on discipline problems. If a class is not controlled, learning cannot take place. It is the same with parenting. The child has to be under control for learning to take place. In the younger years, the child will comply because they know the expectations, and they know what consequences will result if they do not comply. As they internalize godly principles, they will learn to comply because of a love for God and love for what is right. Romans 13:1-2, “Everyone must submit himself to the governing authorities, for there is no authority except that which God has established. The authorities that exist have been established by God. Consequently, he who rebels against the authority is rebelling against what God has instituted, and those who do so will bring judgment on themselves. God has created order. He created government, parents, and teachers, and this order is dependent upon each accepting his God given position and accepting his authority to make it work. And it requires citizens and children paying the honor due to each position. It requires parents doing their job to raise the next generation to do their part in participating in the civil society God has orchestrated and ordained. We would be disobedient to not respect the order that God has ordained. Authority is necessary in society and in the home, because it brings order. If everyone did their own thing it would be chaos. Whether the differences were preference or outright sin wouldn’t matter. If we don’t work together in an orderly way, there is chaos. Think about what traffic would be like if there were no rules, signs, lights or road markings! Rules and authority bring order, productivity, peace and safety. As parents, we are our children's first and closest look at what authority is like. If we want our children to have a healthy relationship with authority in the future, especially God, we need to be fair, good, loving, and respectful, but also strong, consistent, knowledgeable, instructive, confident, directive and authoritative. One of the problems with democratic parenting (the idea that reduces parents to an equal status with their children), is that if a child feels equal with his parents, he will not understand the importance of obeying police officers, school teachers, AWANA leaders, etc. And if they don’t see the necessity of obeying, they won’t be able to learn from these “authorities” the things that they will need to know to grow in knowledge, relational skills and their relationship with God. Are you up to the challenge? Are you willing to accept you mission (which, yes, at times may seem impossible) to parent with the authority that God has given you? Our prayer is that you are because In a very real way ... our future depends on you. Who is leading whom at your house? If we do not teach our children not to be demanding, inconsiderate, disruptive, selfish, and disobedient, we are allowing them to believe that there are no rules, or no “law”, so to speak. How will they become conscious of sin? How will they know that God has a different way for them, and that they will need Him for salvation and for the power to live a holy life that is pleasing to Him? 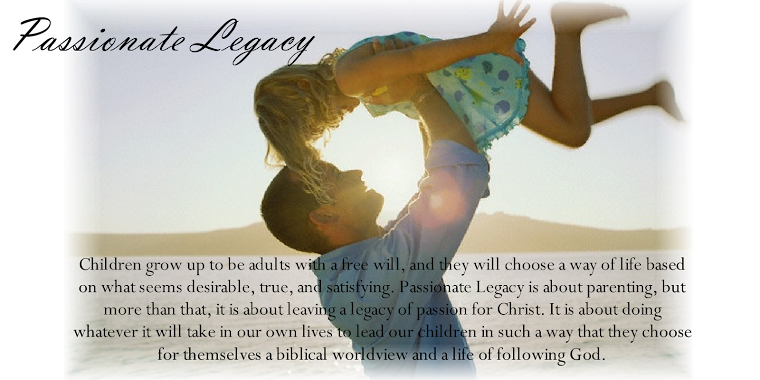 Passionate Legacy Principle #2: Accept your right and responsibility to train your children to biblical morality (Proverbs 22:6). The parents have been given the responsibility to train, care and provide for a household. With that comes the authority to determine and enforce the principles that will be lived out in the home. Be confident in your authority. Parents should not feel guilty for directing or disciplining their children. If your child doesn’t like you once in a while, that’s okay! Don’t make being a buddy such a high priority that you can’t be an effective leader. Deep down, children desire consistent boundaries; they provide protection, security, freedom and peaceful coexistence with others. Structured moral training in the early years is essential because self-control is gained through moral training, and all other virtues are dependent upon self-control. While her mother ordered their fast food lunch, five year old Molly demanded one thing and then changed her mind and demanded another … several times. Molly repeatedly interrupted her mother by yelling, “No, I don’t want that,” making rude noises, and pounding on her mother’s leg. When the family and I went to choose a table, Molly chose a different table and demanded that her mother move. Her mother obeyed. Then, Molly changed to yet another table and ordered her mother to change again, but her mother refused. Molly began to scream and yell, argue and accuse, whine and cry, and finally verbally assault her mother with name calling. Her mother tried to grab her arm, but she darted across the room and under a table. Her mother did not go to get her but instead told me that she had tried everything, including spanking, and nothing had worked. Molly would not cry, would not apologize, and her behavior would not change. Parents have been given the responsibility to train their children. In First Samuel 3:12-14, God says he will judge Eli’s family forever, because Eli knew his sons were committing sin but failed to restrain them. Sometimes we know our children are getting into things that they shouldn’t, but we are too engrossed in Facebook or our favorite show to deal with it, so we let it slide “just this once.” We hear our children in the other room treating each other with hatred and violence but we don’t stop what we are doing to teach them how to resolve conflict. At times we know that our children are being disrespectful to teachers or bullying others at school, but we leave it to the teachers to deal with. Training our children is our responsibility, and restraining them when they sin, is part of it. Proverbs 22:6 says, “Train a child in the way he should go, and when he is old he will not turn from it.” The book is Proverbs. A proverb is an observation of life that is generally true, it is not a promise because of course there are exceptions to these general principles and observations of life. Many principles in Proverbs are repeated with different wording throughout the book. So looking at other proverbs in the context can provide clues to the meaning of this proverb. Let’s look at some surrounding parenting Proverbs. Proverbs 19:18 says “Discipline your son, for in that there is hope, do not be a willing party to his death.” This verse teaches that there is an actual right and wrong and if we don’t discipline when wrong is done, we are allowing our children to die spiritually or physically. Proverbs 22:15 says, “Folly is bound up in the heart of a child but the rod of discipline will drive it far from him.” This verse teaches that every child has folly (or foolish rebellion) in his heart, and we need to discipline him to drive it out. Because of these surrounding verses, I believe that the clear meaning of Proverbs 22:6, “Train a child in the way he should go, and when he is old he will not turn from it,” is that there is a specific “way” that he should go, not his own way, or his heart’s way*, but God’s Way, and that if we train him in that way, when he is old, he will most likely go that way. It is not a promise, but a general principle that if we train children when they are young to go God’s way, when they get older they will continue to go God’s way. Ephesians 6:4 reemphasizes our responsibility to train when Paul instructs fathers to “bring your children up in the training and instruction of the Lord.” It is our responsibility to give our children this training and instruction of the Lord. *Some recent and quite creative interpretations of this verse have made their way into popular literature, articles, and sermons. Interpretations that claim that this verse is teaching that we should try to follow and train according to a child’s “natural bent” or “temperament” go against the context of the book of Proverbs, represent a misunderstanding of the historical and literary context, as well as display an anachronistic misunderstanding of psychology and the Scriptures.